You are currently browsing the category archive for the ‘Veronica’ category. When winter was turning to spring we suggested the practice of neighborhood walks to notice change inside and all around. The transition from summer to fall can be a bit rocky. Conscious observation can give you some grounding and appreciation of the cycle of the year and your responses. Take advantage of the light that is still available and put on a few layers (rediscover your wardrobe). Take a 10 minute walk around your neighborhood and look for the signs of transformation. Animals are behaving differently, ourselves included. Listen for the changed sounds, smell the air and notice how different it is now compared to the height of summer. See what others are doing around you and be inspired by their movement. There are new foods becoming available, while others disappear until next year. Buy apples, pears, sunchokes, sweet potatoes, and squashes of all sorts. Look at plants and the changing colors of trees. When you get home, journal about what you noticed and about the experience. If anything came up for you emotionally, perhaps make note of that too. Repeat this process two or three times a week over the next month, until we are solidly into the deep dark. Enjoy this focused awareness of change around you. This is a super quick lunch (or dinner) that I whipped up for a surprise drop-in. I almost never use recipes, so all amounts are approximations and to taste. That said, we were full and had plenty left over for later in the day. Set your beans to cook (if not using canned) and prep pot for your corn.Corn only takes about 5 minutes in a pot of boiling water, so you can drop in pretty close to serving time. Meanwhile: Throw your herbs into your oil and mash until thoroughly blended. I like this super spicy to balance the sweetness of the corn (which I don’t really like), but use your own judgement. Set to cool in the fridge or pop in the freezer for a few minutes. Chop your onion and avocado. Place in a serving bowl with the sprouts. Add the lime juice and mix gently. Place in fridge to cool until ready to serve. Toast your seeds on medium heat in a dry pan. They will pop. 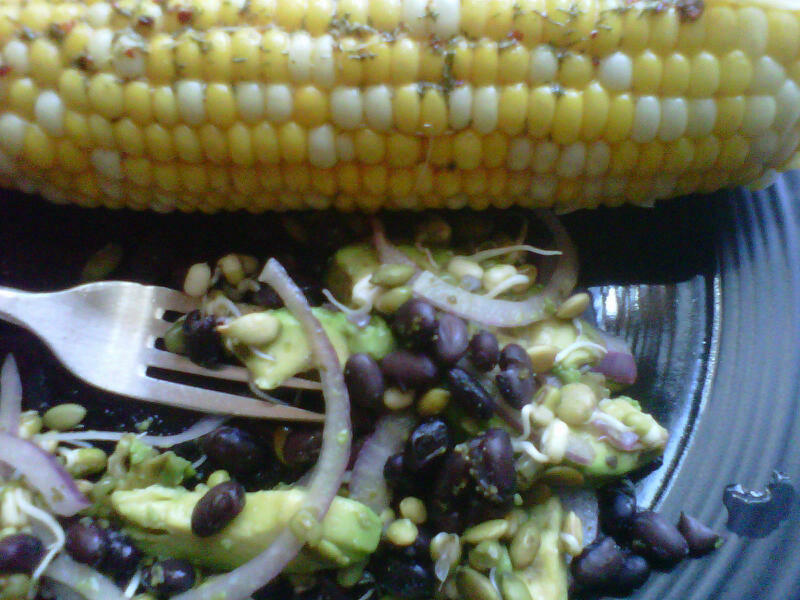 When ready to serve, gently spoon black beans into the onion mixture. Serve and sprinkle with pumpkin seeds. The corn can be pulled right out of the pot onto the plate and the oil mixture spooned on as desired.I love lime, so I spritzed the whole thing again with a bit of juice and also added a dash of kelp (for iodine–I don’t like salt). Again, personal preference. If you have any tortillas around, makes a nice soft taco. Combine flour, yeast and salt. Blend in water, oil and sweetener. Stir until all ingredients are well mixed. Cover with a tea towel and place in a warm place to rise. When doubled in size it is ready to work. Preheat oven to 425°F. Punch down dough. If making a large pie, you can roll out the whole thing. Otherwise, cut into quarters for generous individual pies. We used parchment paper on a cookie sheet to bake the pizzas–makes the crust nice and crispy and makes clean up super easy. For the pizza pictured above, we used prepared pesto, but making your own is super easy (see below). Add enough sauce to cover the crust, but not so much that it is soggy. 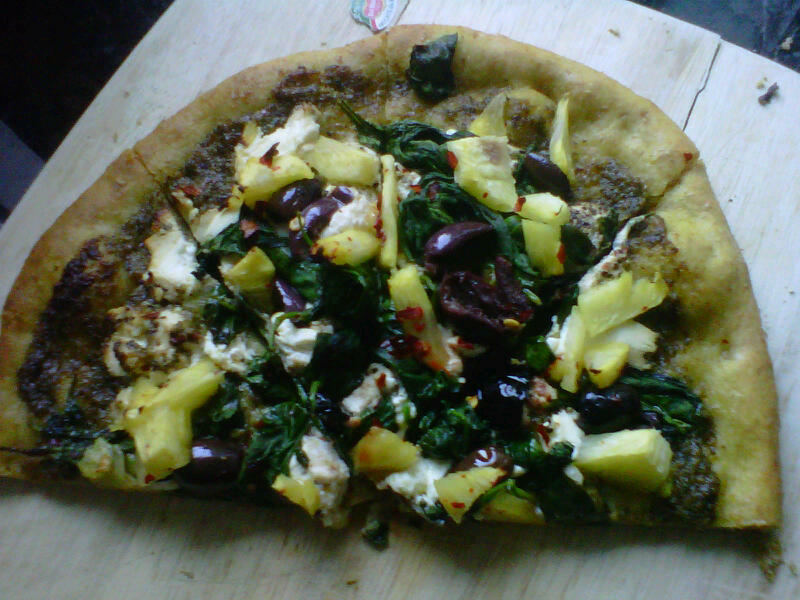 The pictured pizza has layers of black pepper encrusted goat cheese, mixed chopped olives (nicoise, kalamatas), cubed pineapple, wilted spinach, and ground spicy red peppers. It sounds a little crazy. It tastes amazing. Bake in oven 10 minutes or until crust is golden brown. ENJOY! Place four fistfuls of basil leaves, 1/4 cup olive oil, handful of pignoli nuts or walnuts, and a clove of garlic into a blender or food processor. Puree into a thick paste. You may need to add a little bit of water (or olive oil if you prefer) as you puree. I’ve also made a more rustic pesto using a blend of basil leaves and arugula, chopping finely with a knife and smashing a garlic clove into the greens. I drizzle oil into the mixture and use a muddler to crush everything together. It smells phenomenal. Salt and pepper to taste. Some people like to add parmesan cheese. I find it overwhelms the subtleties of the herb and nuts, but by all means add the cheese and omit the salt. This is so easy and delicious. 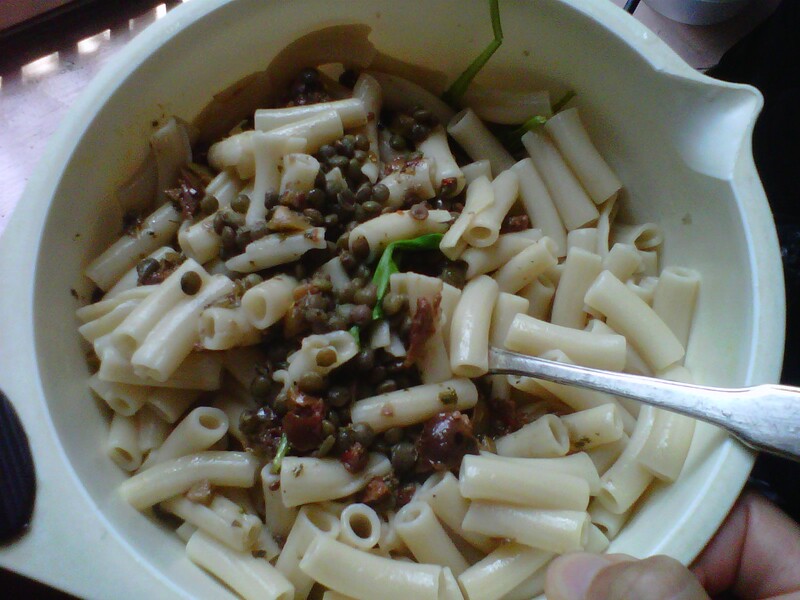 Full of protein, long-lasting carbohydrates for fuel, and some zesty olives for flavor. This quick meal will keep you going. Set the lentils to boil. They take about 15 minutes to cook. Set pasta to boil about 5 minutes after you set the lentils. 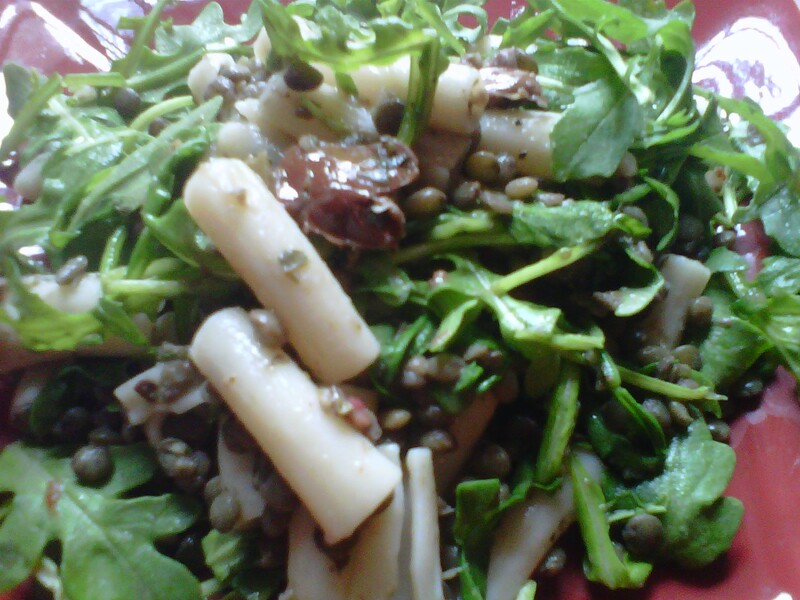 Place arugula in a large bowl with olive oil and lemon juice. 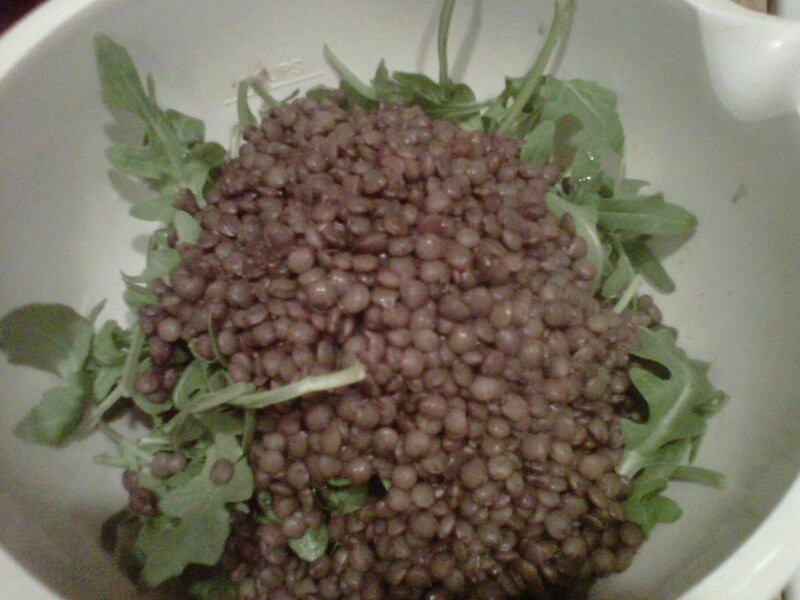 Drain lentils and pour them over the arugula. Drain pasta and rinse with cool water to remove excess starch. Add drained pasta, olives or tapanade, and seasonings to the bowl. Using a fork, gently begin to fold in the pasta. Cellophane noodles “cook” up in 10 minutes. Just soak them in hot water while you do the rest. Mix peanut butter, oil, and tamari. Add water until mixture is consistency of a creamy dressing. Put aside. Chop zucchini and kale. Dry saute zucchini until just tender. Add chopped bok choy. Cook until bok choy brightens in color. Drain noodles and place in a large bowl. 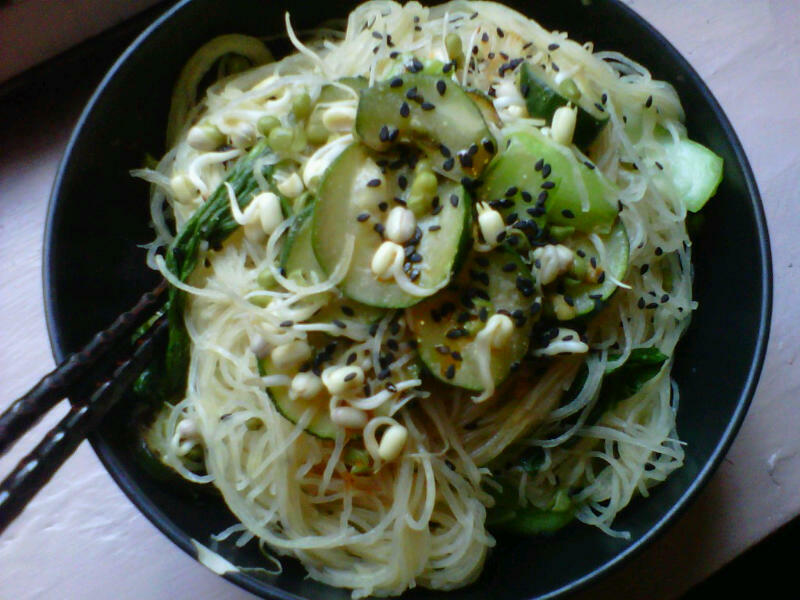 Toss with dressing, sprinkle of sesame seeds, and add vegetables, including raw mung bean sprouts. Cook the rice with the lemongrass. Make sauce by combining tahini, rice vinegar, tamari, and sweet chili paste. Keep the mixture thick. Dry toast pumpkin seeds in a pan on low heat. Seeds will pop. When rice is nearly ready, steam kale. 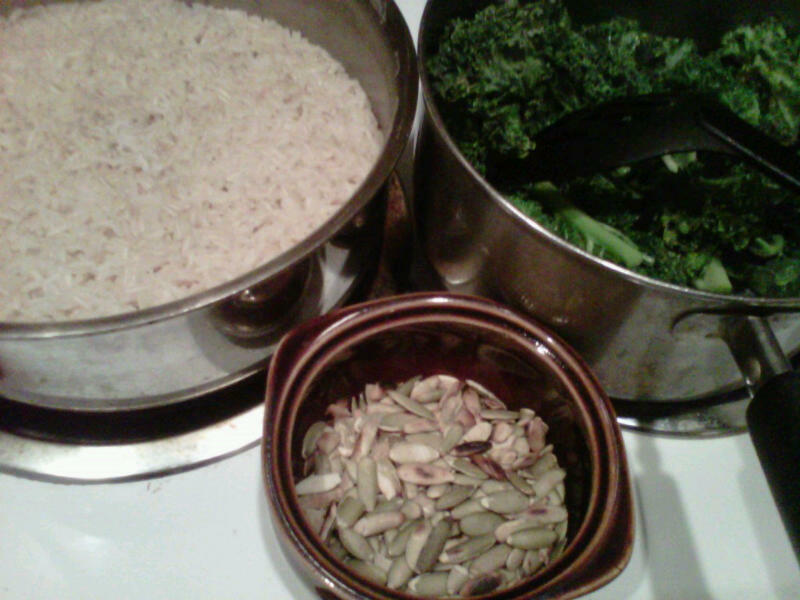 Serve rice as a base with a mound of kale, sprouts, and pumpkin seeds. 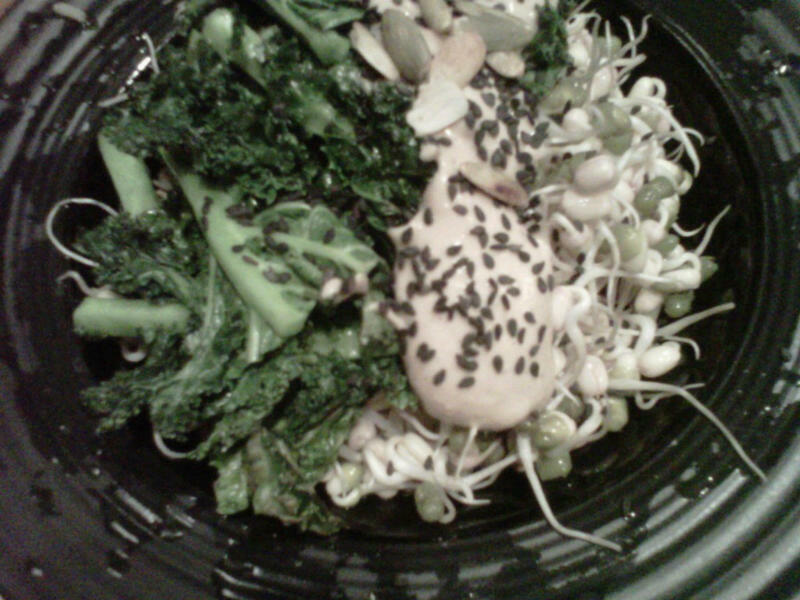 Dollop dressing on top and sprinkle with sesame seeds. Why do we fight exercising? If you want to be healthy, including heart healthy, you’ve got to move your body. And this list doesn’t begin to touch on the benefits to your mind, body composition (fat to muscle), and bones. The American Heart Association guidelines for heart health recommend at least 150 minutes per week of moderate exercise or 75 minutes per week of vigorous exercise (or a combination), or 30 minutes a day, five times a week. What does this mean? It means performing any activity that is rhythmic and can be sustained, such as walking, running, swimming, biking, dancing, jumping on a trampoline–you get the idea. The AHA further states that the 30 minutes can be accumulated throughout the day. Note that these are guidelines for a healthy heart, and that there are different guidelines for fitness gains. Used to doing nothing? Start with something. Make one small change. Walk 10 minutes today. Make it a habit and gradually increase the time spent doing your exercise activity. Explore options for activities you’ve never tried, like a bollywood dance class, and for sharing activity with others, like starting a walking club before or after work. The damage of a sedentary life is cumulative–today, 1 in 3 Americans have some form of cardiovascular disease–but the benefits of exercise are also cumulative. Start right now and make movement a happy part of every day. Try This Move at Home! Set your alarm 5 minutes early for a luxurious stretch before you get out of bed. What better way to set the stage for movement throughout your day than with movement that feels good? Lie on your back and tuck both knees into your chest. Give your shins a good hug. Take a deep breath in and let it out as you bring your nose to your knees, wrapping yourself into a ball shape. Do this 3-4 times. Unravel into an X shape, arms overhead and legs long. Reach your right arm and left leg away from each other for a couple of seconds. Let go and try the other side. Let go and then reach all limbs away from center. Release. Gently raise your right arm and left leg into the air, then switch for a few rounds, getting some blood pumping. Return to knees tucked shape and let them drop off to the right while your arms drift left. Repeat on the other side. Return to your opening ball shape and breathe your way out of bed. Wow! January is all sparkly and new and full of promise and I go and get injured! This after working out the details of intentions for the new year that included dancing, yoga, trapeze, running (with friends! ), and more. Am I derailed? Depressed? Have I thrown away the intention to move the way my body needs to move? I have to admit that suspending my yoga studio membership so that I could heal without the temptation of taking a class really took the life out of me. “My home practice will really thrive” is how I consoled myself, but it is actually true. Having an injury has led to focused attention on my needs right now, with the understanding that those needs are not permanent, nor do I know how long they will be present. I have to stop, listen, and be kind. I have to practice being me the way I am right now. I was sad for about a day, clinging, until I emerged to see what the yoga practice would hold for me. Postures that were so easy are now excruciatingly painful. On the other hand, I have time to explore postures that are not the mainstay of my day to day life. My meditation practice is unchanged save for my sitting position. Restorative yoga is as delicious as ever, with a few additional cushions. I have cushions. I can adjust. I am flexible of mind, not just of body. Running and dancing will be there when I heal. In the meantime, I’m giving energy to being well. The core of my intentions remains. The manifestation has changed. 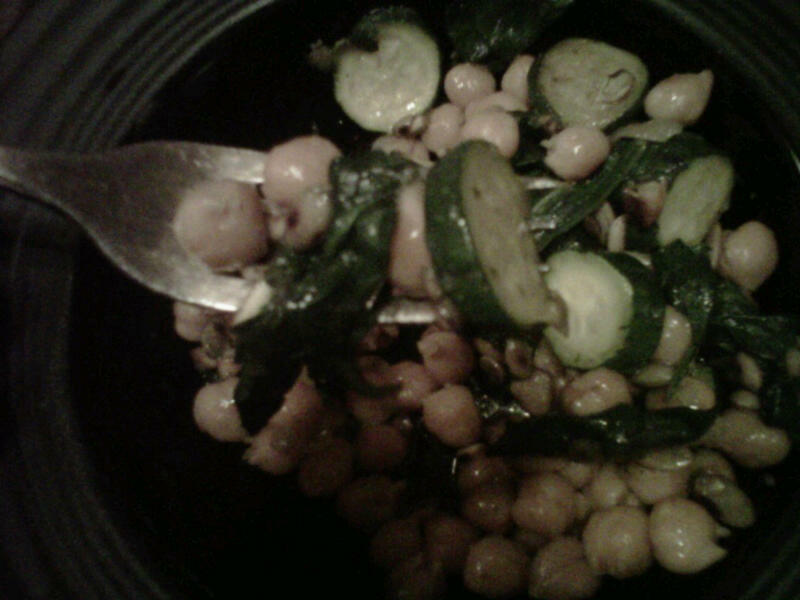 I’ve been on a chickpea kick. What’s not to love? They are versatile and nutritious, with healthy fats, protein, and carbohydrates for energy. The pumpkin seeds add a nice crunch. This meal was a complete surprise. I arrived home exhausted and hungry, and not really in the mood to cook (BUT HUNGRY). I used what was laying around the house for this 5 minute, one pan meal. Enjoy! Lightly coat a pan with olive oil (to your taste–I like a good amount of olive oil, but you can lightly spray too) and saute sliced baby zucchinis for about a minute. Add drained can of chickpeas and broth. Stir gently for about a minute and add spinach. When spinach leaves are slightly wilted, turn off burner and let sit for another minute. Add pumpkin seeds when serving. You can also add cayenne for a spicy kick. Add salt to taste (note that canned beans are often salted already).